Yoturo's coffee tamper was designed with quality, function, and convenience in mind, It is manufactured with an ergonomic and smooth solid handle for a comfortable and sturdy grip. Precision machined, ultra smooth high grade solid stainless steel base. The sturdy weight and durable base allows for evenly distributed pressure when tamping the finest grounds in order to produce your ideal espresso coffee. The food grade stainless steel coffee base by Yoturo is a great blend of style and durability. Useful for both commercial and home use, You will get many years of satisfaction using it. Coffee shop quality - tamp your coffee like the professionals with this espresso tools. Tamper is compatible with most modern filter baskets for easy, convenient and fast use. Check your coffee machine's instruction manual or ask the manufacturer to find out what size tamper will fit your machine. We have many different sizes, please check that this will fit your filter basket before purchasing. Life is too short for bad coffee!!! What are you waiting for? Starts your day in a good mood with a cup of delicious coffee made by this tamper. order your tamper now! 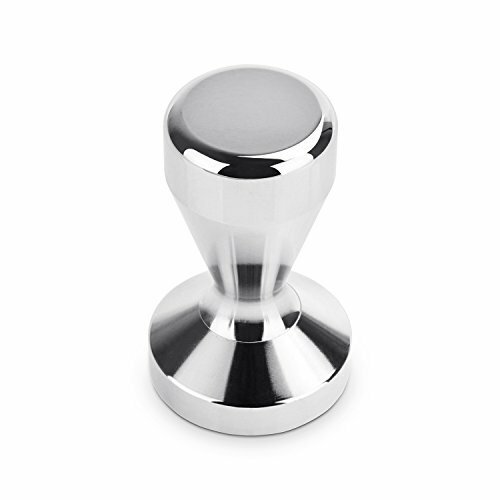 ► SUPERIOR QUALITY DURABLE MATERIALS: The coffee tamper made from 100% premium durable, BPA-free, food-grade and rust-resistant stainless steel solid flat base that extremely resistant to abrasion also, Hefty weight but not overly heavy. ► ERGONOMIC AND COMFORTABLE DESIGN: The Espresso Base is perfectly ergonomic with Grip Handle, Feels great in the hand, convenient to grip ,press and clean. Perfect for tamping fresh ground espresso before brewing. ► ENJOY SATISFYING FLAVOR: Extract richer flavor by tamping down (packing) your coffee or espresso. It making for a more satisfying cup and make the world of difference to the end result with superior quality, a great gift for any coffee lover. ► VERSATILE: With this high quality pressure well-distributed and labor-saving espresso tamper flat base, you will have a prefect shoot, even pressed espresso grind. It fits all types of espresso and coffee machines. ► DISHWASHER SAFE: The flat and smooth coffee base bottom distributes pressure evenly and makes it easy to tamp down coffee and easy to clean, wipe with wet towel, convenient for hand wash. If you have any questions about this product by Yoturo, contact us by completing and submitting the form below. If you are looking for a specif part number, please include it with your message.